The thyroid activity is effectively regulated via the plasma concentration of thyrotropin (TSH) in normal man. The pituitary secretion of TSH is under the influence of both stimulatory and inhibitory factors. The primary control of TSH secretion is believed to be mediated through the interaction between the negative feedback effects of thyroxine (T4) and triiodothyronine (T3) and the stimulatory effect of thyrotropin releasing hormone (TRH) secreted by the hypothalamus (1). The peptidergic neurons releasing TRH are then in turn regulated by bioaminergic neurons connected with higher brain centers involved in the relay of stress and temperature influences and possibly also with a brain center with circadian oscillator activity. The regulatory system is, however, more complex. It has recently been shown that both somatostatin (2) and dopamine (3) have an inhibitory effect on TSH secretion, probably of physiological significance for the regulation. 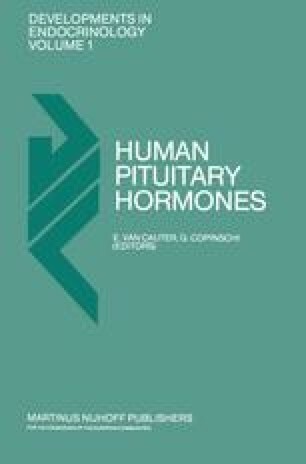 Estrogen, growth hormone, and glucocorticoids can also influence the TSH secretion at least when pharmacological doses or pathological states are considered. This study was supported by the Danish Research Council.